Use DATEDIF to calculate time between dates. The syntax for this formula is very simple. The formula contains 3 arguments which are the start date, end date and then the interval time you wish to measure the time difference in. This can be days, months, and years. The data below represents subscriptions numbers with the start and end date of subscriptions. We are going to use the DATEDIF function to calculate the days, months and years in the subscription using the unit above. 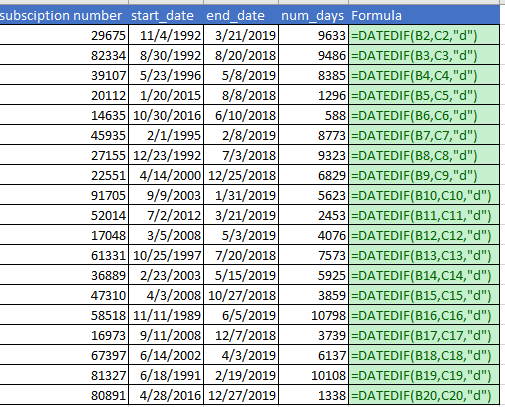 How to calculate the days between two dates. Use the DATEDIF function to bring in the A2 and B2 cells and using the “d” unit which signifies days. 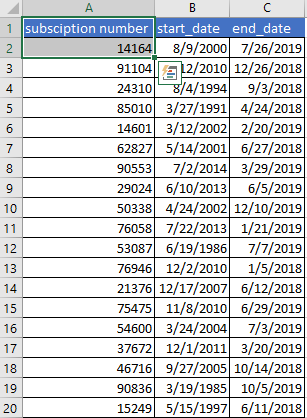 You can calculate the number of years simply by changing the unit abbreviation from “d” to “y” in the DATEDIF function. How to calculate the months between two dates? You can calculate the number of months between two dates by using the DATEDIF function with the “m” unit abbreviation.